Prior to the start of a project's design, our staff is available to assist Owners with the development of the project scope, establishing of initial project cost estimates, budgets and schedules, and to assist in the selection of design consultants and contractors. This initial design effort can include the development of a programming document for use by the Owner's Design Team, or by the Owner's Design-Build Contractor. This initial design effort may also include reviews of the design documents as prepared by the Owner's Design Team at the preliminary, schematic, design development and construction document phases. During construction, our staff can provide contract administration services which can include the review of product submittal data, the review of Requests for Information and Design Change / Variation Requests as submitted by the Contractor, the preparation of Requests for Proposals / Change Orders to address modifications in the scope of work, and the review of pay requests. Other services include the preparation of agendas and minutes for pre-bid meetings, pre-construction meetings and weekly progress meetings, and project close-out services. On-site monitoring of all construction phases to ensure that the quality of work complies with the requirements outlined within the construction documents and any post-award modifications. Our employees look at workmanship and watch for any errors, deviations or defects in the work with the goal of working with the Owner, the Owner's Design Team and the Contractor to identify problems early and address them promptly. Any deficiencies are thoroughly documented and tracked until they have been resolved. All observations relating to the status of the work are communicated to all parties in the form of daily or weekly reports. 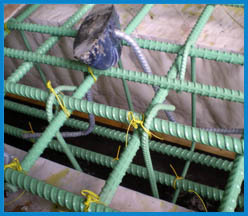 Additional project record keeping services are available and include the maintenance of the project's Submittal log, the Request for Information log, the Design Change / Variation Request log and the Change Order log, as well as the verification and/or maintenance of the drawings of record (as-built drawings). Special inspection services to fulfill the requirements for Special Inspection established by the International Code Council (ICC), formerly the International Council of Building Officials (ICBO). The primary Special Inspection categories are; Reinforced Concrete, Spray-applied Fireproofing, Structural Steel and Bolting, Structural Masonry, and Structural Welding. 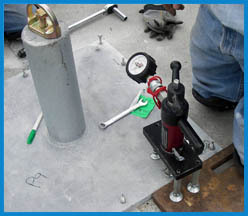 Our Special Inspectors are ICC certified for concrete testing and AWS CWI certified for weld inspection. We also have WAQTC certified inspectors available for Federally funded projects. We have performed the above listed special inspection services on numerous multi-million dollar projects. 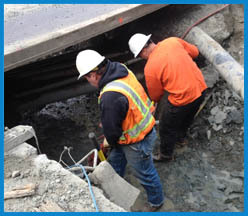 On-site testing following excavation and during the placement and compaction of soils. Tests include field moisture tests and density tests, using nuclear and conventional methods, as well as periodic sampling of materials to verify continued compliance and uniform quality with the required specifications or standards. Slump, air content, temperature and unit weight testing, compressive strength of concrete, grout and mortar, and review of concrete design mixes. Asphalt content, maximum density (Marshall or Rice), construction quality control, review of asphalt mix designs. Document pre-blast conditions of homes and structures, and monitor and record seismic vibrations from blasting operations. Inspection of welds and on-site welding operations in accordance with AWS D1.1, review of Weld Procedure Specifications and Welder Qualifications, Qualification of Weld Procedure Specifications and welders. Construction staking and coordination of testing services.